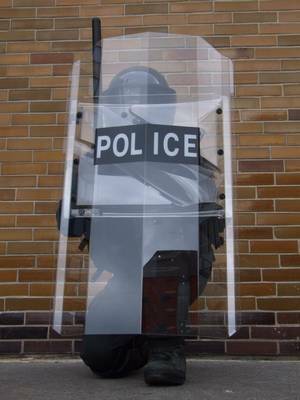 Workers in the ESP Company, with headquarters in Prague, came with the idea of developing a perfect shield for police units. Policemen not only in our country, but also abroad, repeatedly criticised their inadequate and low quality equipment. Many of their complaints related to the then current shields which fulfilled unsatisfactorily the requirements of members of the so-called “anti-demonstration units”. No wonder. 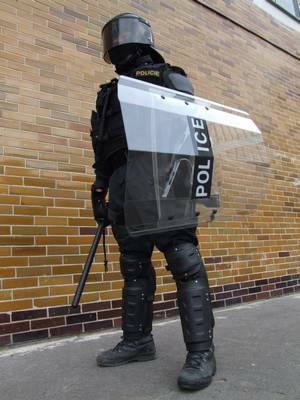 It is the shield which should perform basic tasks protecting health during rampages of soccer fans or during street fights with angry radicals. 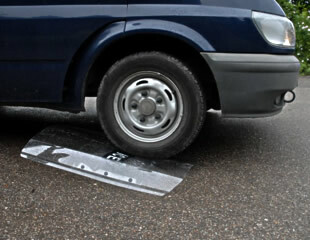 It is the key in the passive protection, which should enjoy the trust of a policeman. It is the screen put against flying cobblestones or atilt baseball bats. The events surrounding the two big actions in Prague, i.e. the meeting of the International Monetary Fund taking place at the beginning of the third Millennium, have confirmed the indisputable need of the new high quality and practical protective equipment, especially the mentioned shields.At that time, the real regular war was taking place in the city streets for two long days. Groups of fanatic vandals, who came to the city from around the world, tried to destroy almost everything in their reach. There were tens of cars put on fire and the streets were covered with thrown rocks.That was the result of a weird “protest against the globalization”. And there were also many injured policemen. In many situations, the defenders of the order hid in vain behind their shields (sometimes wearing only shirts and no other protective equipment …). The shields got smaller and smaller because of on them falling rocks, which broke the low quality plastics of the then completely inadequate protective shields. Thanks to this experience, there was the first outcry heard calling for a better equipment. 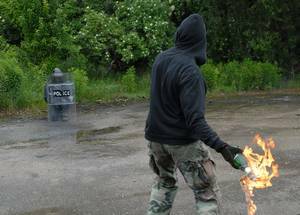 The equipment should be not only light in its weight, but it should allow for a quick handling in action, be adequately resistant and protect against any expected forms of attacks. However, these requirements were too demanding at that time and the situation was mostly resolved with varied compromises. It is also true that the then technology could not provide materials for an ideal shield, which would be resistant “against everything”. As we heard similar demands also from abroad, ESP workers started the advanced development. They intensively collected information from around the world, conducted long experiments and progressively included all requirements in the final design. We must admit that the route towards the implementation of all these mentioned requirements was very hard. The optimal product has been the result of determined efforts of our technologists and designers. It has been verified by tens of advanced destruction tests. The looking for the best available material was not easy and took a long time. In the end, there has been the product developed, which, in the opinion of many experts, has no parallel. This is true not only in our country, but also in elsewhere. We have opted for a special clone of ballistic carbonate as the construction material. It provides the shield with an extremely high destruction resistance. In addition, attacks are countered with a special arrow shape of the front plate featuring five angles. It diverts any strikes or stabs from the direct angle and makes them relatively not harmful. The used technology also allowed for the combination of an ideal resistance with the low weight of the whole unit – it is not difficult to hold it during a security activity without a support for a long time and it allows for an easy and ready one arm handling in different actions. Also, we had to resolve the dilemma related to the optimal size of the new shield. It has to perform universally all tasks during any thinkable activities undertaken by security units. We have finally opted for the size which covers the whole kneeling body, with the exception of the helmet’s top. 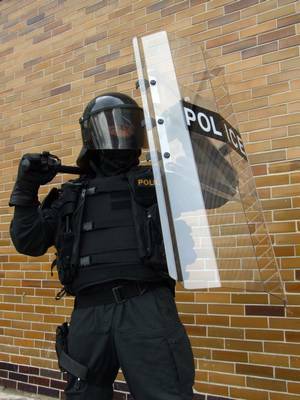 When the person using the shield stands, only his or her lower legs (mostly protected by other protecting equipment) stay uncovered. When kneeling, it can practically cover the whole profile of an even very tall person. However, the whole unit is compact and it does not limit policemen in heavy wear in his or her movements. The suspension system has been also the result of long and demanding development. It differs from other known shields by its single arm, or two arms holding. 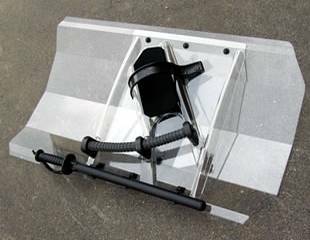 It provides better fixation and handling of a pressure by masses or protection against strong strikes, kicks and falls. In addition, the fixation arm hook has been designed to suit both smaller arms without protectors and bigger arms bandaged in a thick layer of “anti-strike material”. 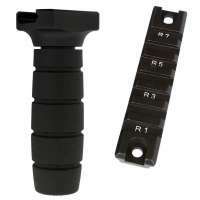 The handle has been covered with a rubber anti-slippage layer allowing for a better hold. In addition, it diminishes the transfer of striking power to the limb. The whole design of the suspension system contributes to this – the resonance of even the strongest strikes is so negligible that even “a weak woman” can hold the shield during the most powerful pounding by heavy objects (this has been confirmed in demonstrations). And this is possible also when held by a single arm. However, the biggest asset relates to the unbelievable resistance of the new shield. The strength of the system was at first designed for the most commonly defined loads (i.e. to withhold common strikes and possibly pulls of a person hanging on the shield). In the end, we found that the unit manages even much more demanding tests well – the shield “survived” multiple running over by car – the van Ford Transit. 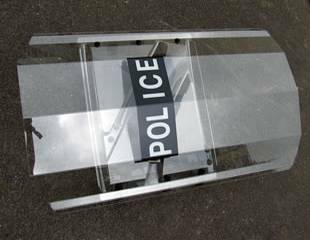 One of the latest innovation plans is to install a special baton or tonfa holder on the inner side of the shield. A member of the security team thus can put his or her “tool” into it at any time. This provides him or her with the chance to free the arm for other important activities, while the enforcing tool is still continuously available for an immediate action. What were the Results of Tests? The end of one of many demanding tests – the tools of “destroyers” were put on the ground beside the shield after one hour of testing. There were all different attacks of street fighters simulated – from thrown rocks and shooting of nuts and bearing balls by slings, the pounding by metal pipes to the realistic simulation of attacks by a spear and a sword. The shield resisted all these trials. These fantastic test results have been transferred into orders by not only the classical anti-demonstration units, but also by many Municipal Police forces and, understandably, by prison services. They are the officers who can find themselves, during prison unrests, in situations, when the high quality protection against any thinkable cold weapons is required. The heavy metal baseball bat hammered again and again the front part of the shield. It was used by two very strong people, and they both tried their best to strike the shield with their full power. In the end, after about 5 minutes and about 100 strikes, they gave up very tired. The shield not only survived the pounding, but the “policeman” behind it almost did not feel the strong strikes thanks to the clever design of the suspension system.Another stage in the attempts to destroy this new innovative protective equipment – a steel pipe, a metal Japanese nunchaku and a 26 inches long telescopic ESP baton. 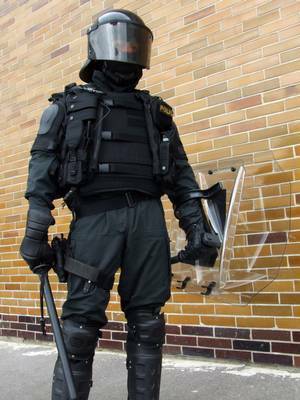 Street fighters equipped like this would become serious opponents to members of security forces. Attacks in full force did not result in any harm - the ESP shield once again did not disappoint us. 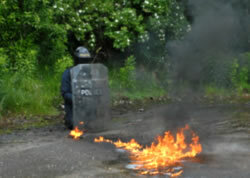 Another test imitated a situation in which a member of an anti-demonstration unit was attacked by a brute equipped with a sword. The sword was manufactured from an army sabre that had its edge made of high quality steel. Both cuts and stabs to the front part were in vain and left only unimportant scratches. However, cuts made from above cut off several small chips from the shield’s edge in the end. The shield could remain in service afterwards anyway.The impacts of stabbing and throws of the metal javelin used in the Olympic Games. In this case, we were quite afraid seeing the person hiding behind the shield. We imagined that the javelin thrown with full force would get through and stop in the person’s stomach – a very unpleasant image. 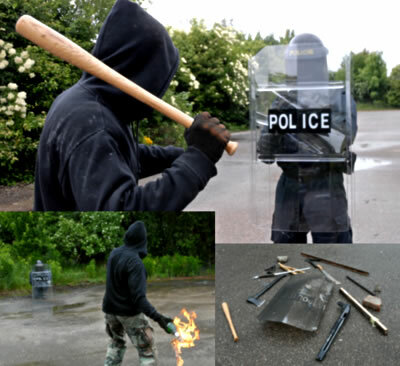 However, the courageous man imitating during our test the attacked policeman remained in one piece – there were only minor scratches on the surface of the high quality material after these hits.The test participants were so frustrated that they decided to damage the shield at any price. They put it on the ground and used an axe with all their power - in vain. The ESP product survived again. A policeman would survive even in such a precarious situation uninjured. 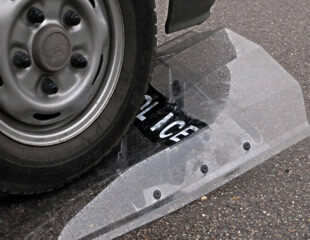 The shield was run over several times by a car and then by a Ford Transit van – both across and lengthwise. This ESP product did not show, surprisingly, any damage, with the exception of few small marks. It should be said that even the designers of this unusual product did not expect these unbelievable results and the convincing quality.The shields can be manufactured with different logos, according to their determination. In addition to logos of the official security units - POLICE and MUNICIPAL POLICE – thanks to the necessity to ensure security in soccer stadiums by private security agencies, they can carry also the logo “SECURITY”. The MILITARY version has been prepared for the army, and not only for the Military Police. The demanding events taking place during missions in Kosovo in the past few years, when our soldiers had to withstand huge massive unrests, asked also for the best available equipment.